Powers: Spirit Energy: Using spirit energy of his body Zen can augment his strength, speed and durability on his own to an extent. 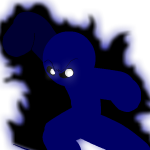 Carnate being the darker but a physical embodiment of his powers holds a much higher supply of spirit energy. Techniques: Ways of Carnate : Through Carnates knowledge in the ways of using Spirit energy, Zen can tab into deeper reservoirs of spirit energy to manipulate in ways he cannot before. Spirit Link: Sychs Zens power with Carnate. Allows hims to use techniques he could not use without this state of mind. Fists of the Mortal Plane: Zen can empower his fists with spirit energy. Imprison: In a burst of speed Zen can grab an opponent and surround them in a pillar of light, trapping them for a short amount of time. done in quick bursts and dissipate or for a extended amount of time depending on Carnates mood on the situation. Soul Crusher]: Channeling all his energy into a point Zen can unleash a big burst of spirit energy into his opponent. The energy spills out of the enemy after making contact which as a result, if the opponent has powers of any spiritual relation will suffer a disruption in any spiritual connection. -Zens has a very unique fighting style. Uses his legs initially to gauge an opponents strength and an act of deception making people think he is cocky in battle. -Uses the environment as if it were an extension of his body. -Utilizes spirit energy to sense movements and intentions of his opponent. -Has high endurance, with a moderate level of movement speed. -At some point, if his opponent is similar to him in any way battle wise, he gets too excited and perhaps bloodthirsty. until they are unable too. -He hates indirect fighters or ones that uses cheap tricks. (long range fighters) At some point he will lose his cool and attack recklessly but relentlessly. -If Zen does not use spirit link the best he can do using spirit energy is sensing others, and empowering his body with energy. -If Carnate uses Ghost step, Zen falls to his knees, with a lot of difficulty in movement, slowly slipping away from consciousness until Carnate returns to his body. -Even with spirit link, with the exception of Fist of the Mortal Plane, he can only use certain techniques like Imprison for short amount of time. -Against others with a certain spiritual presence or energy he becomes more hostile. Cool headed, somewhat social and loves to fight. When he sees someone in trouble he is the first to step up. Has manners but has no problem speaking his mind to anyone regardless of whatever authority they may have ( So not the best in diplomatic relations). I'm glad you are hear. This lands sins....it is to great to handle alone. Please....lend us your strength. @UnifiedEntity, congrats! Your Duelist got on the Roster ! However I don't think the extra bold parts you added under "Ways of Carnate Techniques" was really allowed, I think the only ones is suppose to be the ones that were already there in the original application format, but I stylized it for you in another way! Hope you like it If you don't just hit me up in a PM and I'll fix it to anything else you want.